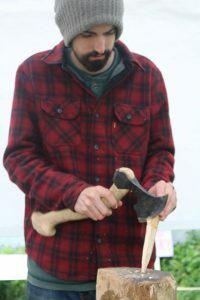 I began teaching myself no spin knife throwing in 2011, learning from Ralph Thorn’s technique. When I joined KATTA later that year, I realised that no spin was largely unheard of in the UK and that I was the only person who practised it as their main focus. In 2017 I took part in the first ever UK championship which held a category for no-spin knife throwing, winning a decisive first place. Later that year I came 4th in Eurothrowers, closely missing a podium throwing against many of the most well known names in the sport. I am unusual in the organisation in that I don’t ever use the spin style, nor do I practice throwing axes. 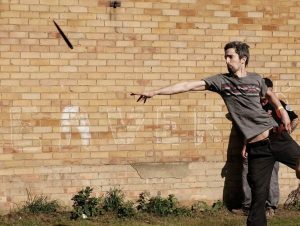 Though I do enjoy a sideline in bo shuriken throwing.